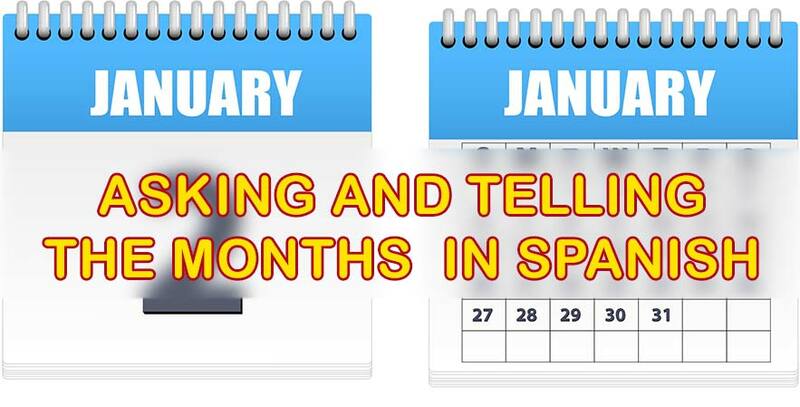 Asking and telling about MONTHS in Spanish – Spanish language lessons for beginners and intermediate speakers. Mi estación favorita es la primavera. My favorite season is the spring. Durante el otoño tomaré clases de yoga. I’ll take yoga classes in the fall. Hace mucho sol en la playa durante las vacaciones de verano. It’s really sunny on the beach during summer vacation. Hace mucho calor en Austin, pero en la biblioteca siempre tengo frío porque la temperatura del aire acondicionador está muy baja. It’s really hot in Austin, but the library is always cold because the air conditioner’s temperatura is very low. El cumpleaños de mi primo es el 29 de febrero. Así que él nació en año bisiesto. My cousin’s birthday is the 29th of February. So he was born during leap year. Afuera está haciendo frío, no apagues la calefacción todavía. It’s cold outside, don’t turn off the heat yet. Este semestre estoy tomando una clase extra. I’m taking an extra class this semester. Nunca salgo de vacaciones durante la Semana Santa. I never go on vacation during holy week. Estudia mucho desde el principio del semestre, así no necesitarás tomar clases en el verano. Study a lot at the beginning of the semestre so you won’t need to take summer classes. Note 1: As with the days of the week the months in Spanish are not capitalized. Note 2: When writing down a date in Spanish, it is good practice to at least abbreviate the month, instead of writing down the numbers. For example, 3/5/99 could be March 5, 1999 or May 3, 1999. This is especially important because Spanish speakers say the day before the month, e.g., “Hoy es el 7 del 8 del 99” (Today is the 7th of August of 1999). ¿Cuál es la fecha hoy? What is the date today? Hoy es el día 8 de agosto de 1999. Today is August 8, 1999. ¿En qué año estamos? What year are we in?/What year is it? Estamos en el a–o 1999. It’s 1999. ¿Cuál es la fecha de su nacimiento? What is your birth date? ¿Cuál es su fecha de nacimiento? What is your birth date? Yo nací el 24 de julio de 1955. I was born (on) July 24, 1955. ¿En qué año nació usted? What year were you born? Nací en el 1962. I was born in 1962.